Now Foods UC-II® is a dietary supplement which contains collagen type II UC-II® and seaweed minerals Aquamin® TG. UC-II® ‒ undenatured collagen type II. It shows effectiveness in very low doses of 40 mg per day, compared to the doses of classic collagen hydrolysate, which are even up to 10 g. The molecules of this collagen are not distorted by the impact of high temperatures, so they retain maximum functionality. Collagen type II occurs mainly in cartilage. Aquamin® TG ‒ a complex of mineral nutrients derived from seaweed. It partially complements the nutritional deficiencies, improving the functioning of the body system and increasing the amount of building material for bones. There are up to 12 types of collagen. Different types are components of various tissues; one collagen type in cartilage, another in intertissue membranes, scar tissues, endothelium and in many other tissues. The type II, which is contained in this supplement, has the greatest importance for the health of joint cartilage. The main function of this protein is to provide tissue elasticity. This applies not only to joints and bones, but also to skin and its derivatives, blood vessels and every organ in the body system. Adequate supply of minerals, especially calcium, is of crucial importance in maintaining the health of bones and joints. It is not possible to maintain the proper skeletal structure, if we do not have access to adequate quantities of building materials that can make up losses. 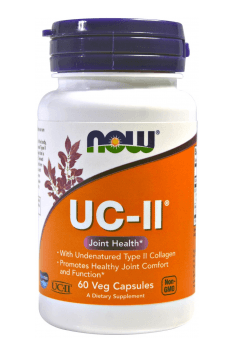 In the clinical study conducted on people, the researchers found that already one capsule per day, containing 40 mg of UC-II® helps to improve joints condition, by maintaining their proper function and flexibility. With the scientifically proven supplement efficacy, we can be sure about the effectiveness and we don't have to worry about losing our money. To avoid experiments with our own health, it is worth trying a proven and effective product. It can be surprising for some people that collagen type II can affect the activity of the immune system. The supplementation may change the levels and degree of activity of T-lymphocytes and some interleukins, particularly IL-10 and IL-17. The activity associated with the immune system is the cause of beneficial influence of this collagen type on autoimmune diseases that attack joints, e.g. rheumatoid arthritis (RA). Classic supplements containing hydrolyzed collagen require very high doses to notice any effect. The average dose of this collagen form is 10 g, or about 2–3 teaspoons of pure powder. The effective dose of collagen in the form of UC-II is contained in a small, convenient capsule, whose consumption does not make any problem. This is by far more convenient form than swallowing large tablets or drinking water with tasteless powder. Now Foods UC-II® is recommended for people complaining about joint pains and for those who want to support the health of the musculoskeletal system and protect themselves from potential ailments in the future. The best results of collagen supplementation are achieved on an empty stomach – taken in the morning before breakfast or 2-3 after a meal. Collagen administration with a meal can decrease its efficacy due to the action of gastric juice which partly digests collagen. A dose of 40 mg (one capsule) of collagen per day is believed to be effective in reducing symptoms associated with degenerative diseases and rheumatoid arthritis. To obtain the best effects, it is suggested to take the supplement for 2-4 months. A dietary supplement that supports healthy hair, skin and nails.